Dr James Bowman is a specialist ear, nose and throat surgeon who treats both children and adults. James has degrees in both Dentistry and Medicine and completed his advanced surgical training in Queensland in 2009. 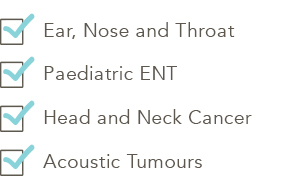 He has completed further specialist training in head and neck cancer as well as conditions of the skull base such as acoustic neuromas. Copyright © 2013 Skull Base Surgery. Created by Bluego Design.